I mentioned a few weeks ago that I got a huge Lodge Cast Iron Wok for Christmas (Link to this wok on Amazon at the end of this post, if you’re interested in checking it out.). And you all know how I love cast iron! While I wanted it mainly for stir-fries, the first thing I actually made in it was a soup. This soup. And if I do say so myself, it was a delicious debut. 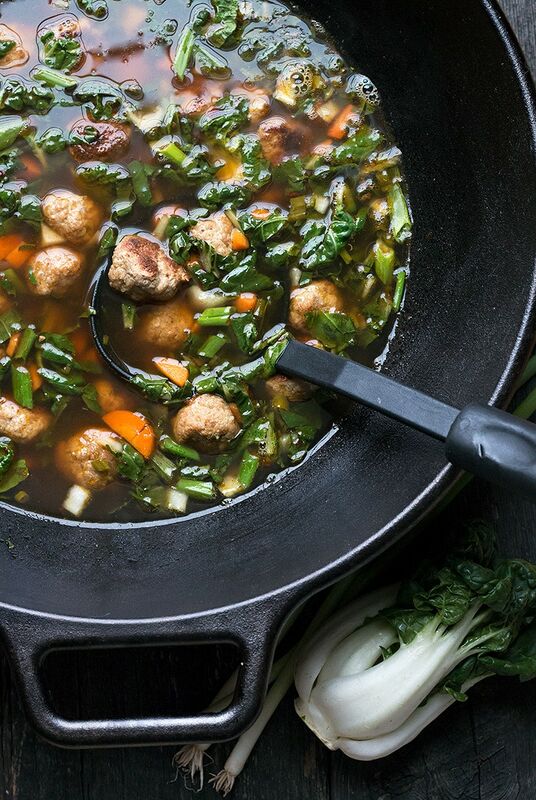 This soup is not only quick and easy, but it’s just plain delicious. Even my “I’m not sure I think a broth soup really qualifies as dinner” husband was totally won over by this one. I credit the pork meatballs. They are full of flavour and perfectly filling, so despite the brothy soup and all the greens, there’s definitely a good bit of heartiness here. If you’re cook once/enjoy twice inclined, you might want to consider making a double batch of these pork meatballs. 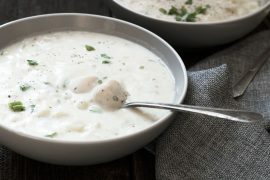 Use one batch for this soup and freeze the other batch for future meals. You can use them to make a rice bowl, with a great Asian sauce and lots of veggies. Or pick up some steamed bao buns and make a Korean meatball sandwich with them, with a Korean-style sauce and pickled vegetables. Once you try these meatballs, you’ll want to use them everywhere! So as you add ginger here, keep in mind that a little goes a long way and adjust the amount you add to your own personal preference where ginger is concerned. I love the ginger paste in the tubes (available in the produce section of most grocery stores). It’s milder, handy and much less likely to overpower a dish. If you have a similar cautiousness where ginger is concerned, you might find the paste easier to work with, as well. Did you know you can freeze fresh ginger? Simply place a fresh ginger root in a freezer bag and pop it in the freezer. To use, simply grate from frozen. No need to thaw. Ginger will keep in the freezer for about 6 months. 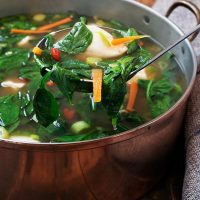 When preparing the bok choy for this soup, trim the stem ends off, then layer the leaves together. Make 2 or 3 vertical slices, the slice thinly horizontally. That way you’ll end up with lovely sized pieces of bok choy in your soup, instead of long stringy ones that are difficult to eat. Turkey (or you can use chicken) noodle soup, with an Asian twist. 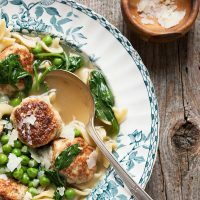 Tender pork meatballs, flavoured with ricotta cheese, with greens and noodles. Super easy, as it starts with store-bought Asian dumplings. 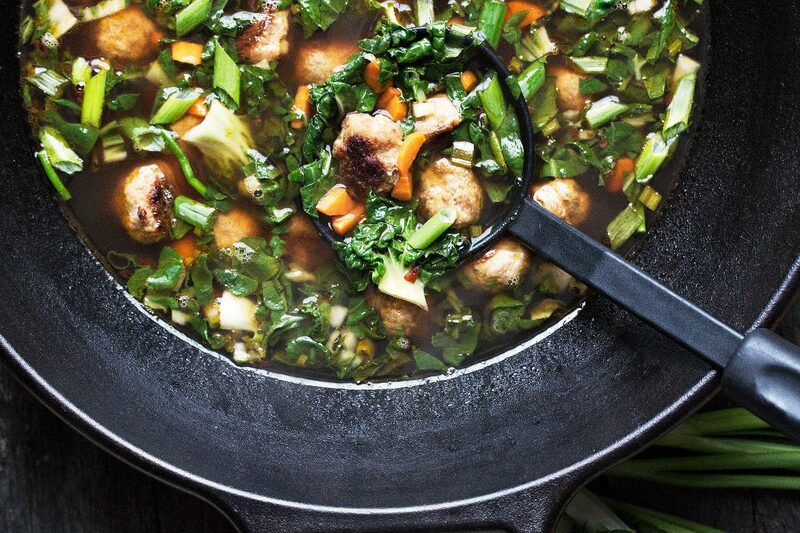 Lots of greens and a great broth. Long-time reader, first-time commenter here. Thanks so much for this post! So much good information. You’re a star. Excellent Soup! I made minor changes: used Vegetable Broth instead of Chicken Broth, and increased the amount by 2 cups (I like a lot of broth), omitted the water, added more ginger (because I love it), and used all parts of the Bok Choy, not just the leaves. The flavor combinations work extremely well together and the vinegar seals the deal. Thanks for the amazing recipe Jennifer. We made this (actually my new-to-cooking boyfriend made it!) and it was so delicious, we deemed it ‘better than a restaurant.’ Second night we served it with rice noodles – truly a treat. Much appreciated and highly recommend! Great meal this evening and easy to assemble. Followed your recommendation and made double the amount of meat balls to save for a stir fry next week. The meatballs were so flavorful. The soup was fantastic and loved the burst of flavor from the sesame oil. The bok chop was al dente and will definitely make again. This is the 2nd time we’re having this soup since the recipe was posted last month. I heeded your advice and made a double batch of the meatballs, portioning them out and then freezing uncooked so that this “quick” meal became even quicker. Outstanding recipe. Flavors are right on. Whole Foods had gai lan (a Chinese green – like spinach and broccoli combined) so I diced the stalks and sauteed them with the carrots. Finished with the greens. I’ll make a triple batch next time since it makes dinner so easy on school/sports nights. So great to hear, Tracy! 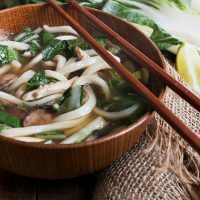 I am a huge fan of this soup, too :) Like the sound of the gai lan. I will keep an eye out for it. Wow – made this last night – wonderful! 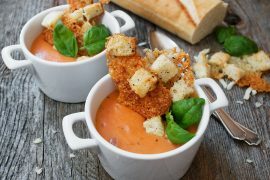 I was out of Panko so I used regular bread crumbs – perfect! I also could only find Baby Bok Choy, so I used all of it. Will make this again for sure! This was so delicious that I made it 2 nights in a row! 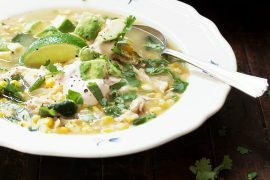 I added chopped cilantro to the broth. On night #1 I used a combination of 1/2 chicken – 1/2 beef broth for a heartier flavor. On night #2 I used only chicken broth. Both versions got rave reviews, and my husband asked if we could have this every week. I love that wok! And why not make a soup in it! The soup is magnificent. Perfect for a cold day! Thanks so much, Mimi! I am loving the wok and it’s actually quite practical for soup, as it is so easy to cook the veg in, like the carrots in this soup. What a gorgeous bowl of soup Jennifer. It must have so much flavor with the ginger. We love bok choy and always look for new ways to use it. Love those meatballs too! Thanks Tricia and yes, those meatballs were most awesome! I love this kind of soup. It hits the spot on a cold gloomy day. This looks like it will go very well with ramen noodles too :-) Will have to try it. Yey for pork meatballs! 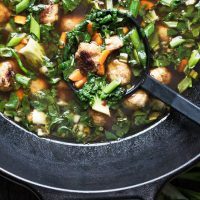 I love your new cast iron wok, very suitable for the cast iron recipes queen:) The Asian flavors are so inviting, will give this soup a try! Pinned! Love your Asian soup series, Jennifer, they’re so distinctive. I’ve still got the flu, so this one is going on the menu for today! Thanks so much Sue. 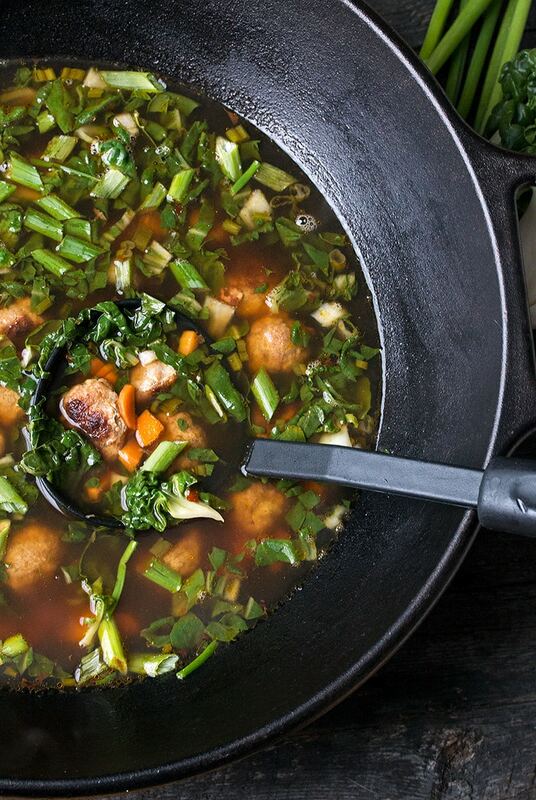 Sorry about your flu, but yes, this is great flu soup. Very comforting! I need a bowl (or the entire pot) of this today! Love the hearty flavours going on here, especially the sesame oil in the broth. Love that stuff!! Thanks Dawn and yes, whenever sesame oil is involved, you can be sure of great flavour! My husband would be all over the meatballs too Jennifer! Served with some nice crusty bread and this would be a delicious meal. Definitely a delicious debut! I’m a big fan of ginger too – but I’ve never put it in my meatballs….I will now!! Gorgeous offering!